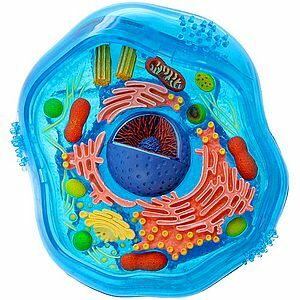 This lesson will introduce cell parts and give a brief description of the function of each of the cell parts. Students will be able to identify the cell parts. The students will be able to describe the function of the cell parts. The teacher will display the image above at the start of the lesson. It can be enlarged to fit the screen better. The teacher will pass out post-it's to the students. Using the post-it's the students will share everything the know about the displayed image. The teacher will instruct the students to get out their interactive notebooks. The teacher will model for the students how to cut out the interactive notebook page. Then, the teacher will model how to draw the cell membrane, nucleus, mitochondria, and cytoplasm and describe specific colors to use when drawing and coloring. The students will follow the teachers directions and draw, label, and color the cell per teacher directive. The teacher will send an email to the students with a link for the Educreations presentation. The teacher will allow the students time to review the presentation and label their cells with more information. The students will log onto their email. They will follow the link provided by the teacher through email. They will watch the presentation and add notes to their cells. The students will share the information they gathered from the presentation. The teacher will guide and aide them to add to the cell drawing. Students will share the information that they added to the cells after reviewing the Educreations presentation. The teacher will send the students a link to a Tellagami video. Follow the video instructions. Then the students will open Tellagami and create their own presentation following the criteria reviewed in the teacher video.